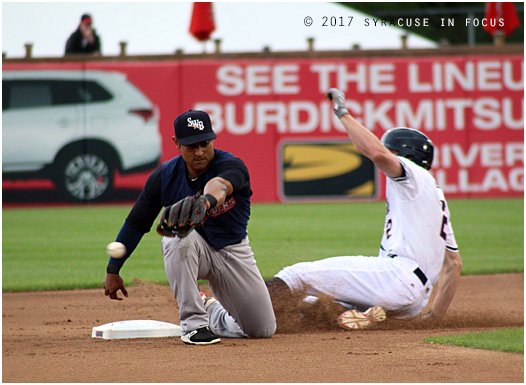 In the first inning of Wednesday’s game Andrew Stevenson (right) and Irving Falu were so close on the base paths that they could probably hear each other breathe. They were both anxious to score, but Falu got called out at home. 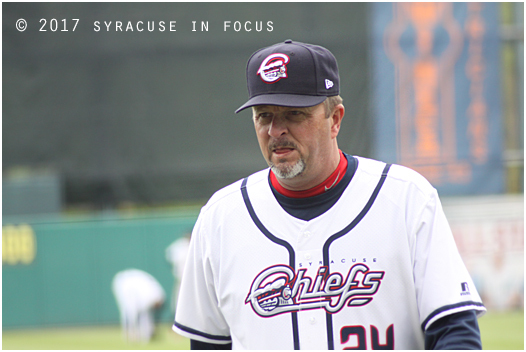 Nonetheless, the Chiefs scored 4 runs in the first and eventually defeated the Iron Pigs 10-6 after being shut out on Independence Day. This risk-taking Billy Ball is alright with us. 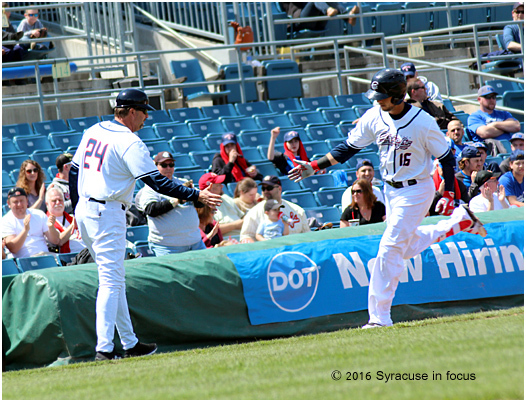 Syracuse Chiefs centerfielder Andrew Stevenson has been swinging the bat well lately. 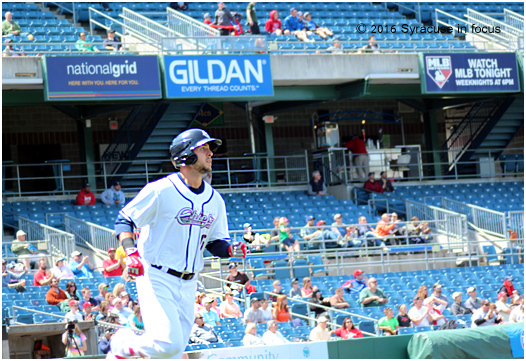 His first inning against Scranton/Wilkes-Barre went something like this: He singled; then stole second base and reached third on an error; then later scored on a sacrifice fly by Brandon Snyder. 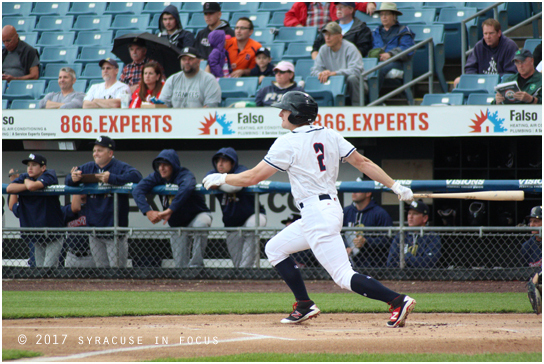 The Chiefs won the game, after a rain delay, 5-2. 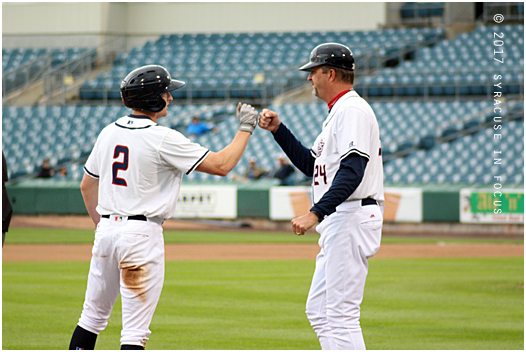 Getting a fist bump from Billy Gardner, Jr.
Matt Skole belted his first home run of the season yesterday during the win over Pawtucket. Here he starts his trot while watching the ball sail over the fence. 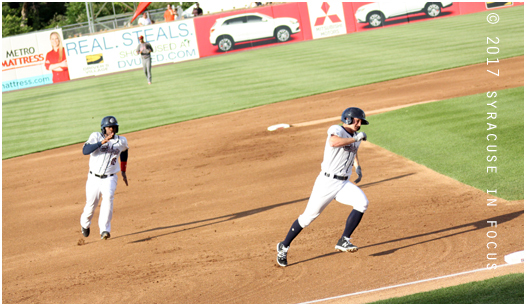 Skipper approved: Billy Gardner congratulates Skole as he rounds third base. Dale and Marion Ladd of Central Square showed up at NBT Bank Stadium today to support Billy Gardner, Jr. Gardner was making his debut as a Triple-A manager for the Syracuse Chiefs. 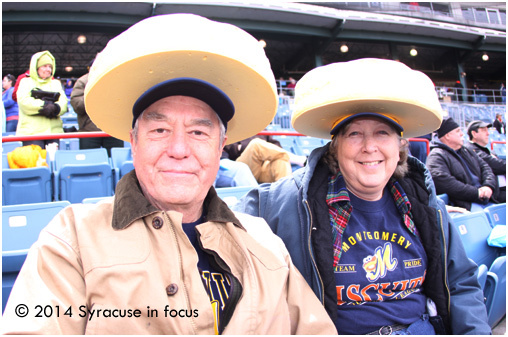 The biscuit hats, according to Marion (whose family is from down South) were a shout out to Gardner’s former team, the Montgomery Biscuits. While with Montgomery in 2012, Gardner was the Southern League’s Manager of the Year.